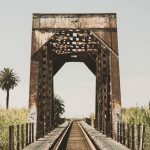 If you are located in Sacramento or near Sacramento, this is a cool little spot to check out. Even if you are coming from the Bay Area and want to smash around in some Tahoe Snow, this a cool spot to check out. The Castle Pass and Castle Peak 4×4 Trail is an incredibly easy to access trail right off the freeway at the same exit as Boreal Ski Report. Sitting at 1-1.5 miles directly up the hill, this is not a crazy long trail by any means. Compared to the Signal Peak 4×4 Trail (4-5 Miles), the Forestdale Divide and the Baltic Ridge Trails (18 Miles), this is simply a fun snow day trail. But, compared to these other trails, there are a bit more hill climbs and rutted out sections. 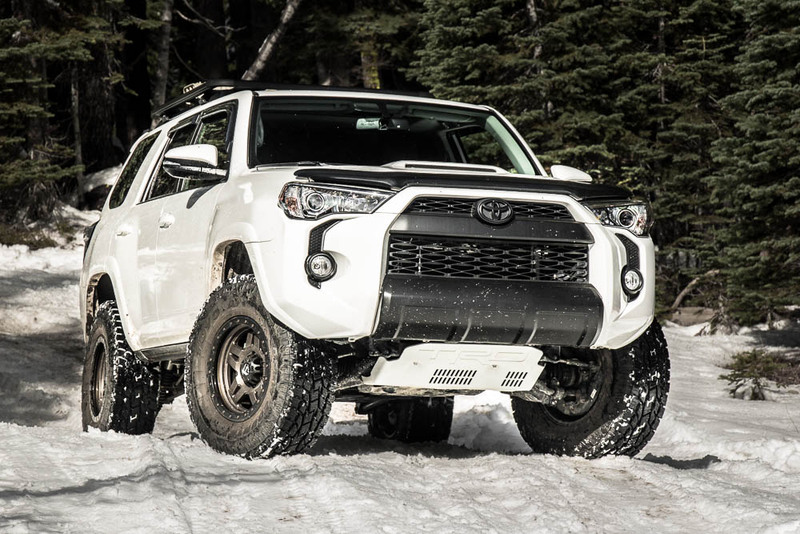 We bottomed out a few times with the 3″ icon stage 2 suspension, but that’s what the TRD skid plate is for. While sitting at only a mile or maybe a little more depending on the season and level of snow, this trail does have a few sections that make it worth checking out. As you are heading through the first sections of the trail this time of the season, you are met with washed out sections, rutted out humps, and running creeks that you will drive through. 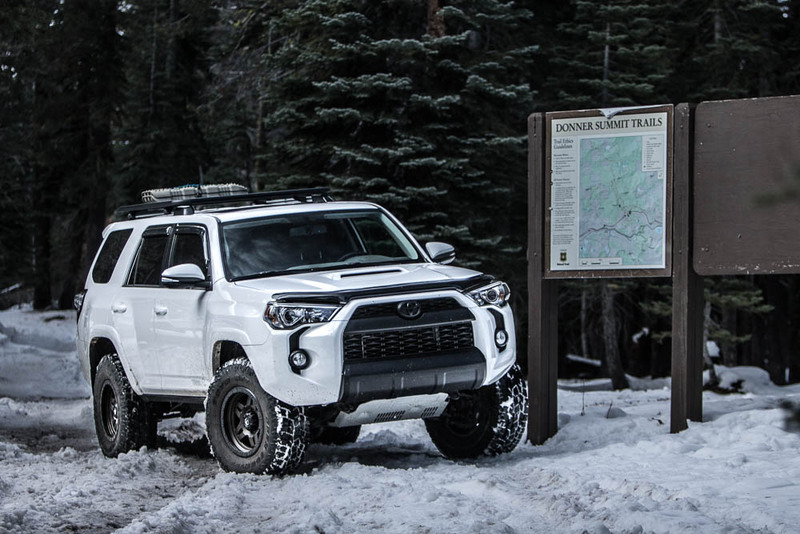 This is also the first time we have had the new Toyo Open Country AT 2’s out in the snow and they performed incredibly well. But, they are new so we will see how they progress on our journey through exploring 4×4 trails in California. 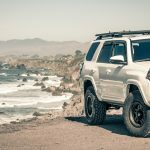 Also, we got a chance to test out new settings on the Boafeng HAM (Ameture) Radios that My Off-Road Radio synced up for us, you can find those in our top 4Runner Off-Road Accessories post. Depending on the time of year, the gate might be closed. In our case, the gate was closed. Once you first roll up onto the Castle Pass and Castle Peak 4×4 Trail, you will have to go around the closed gate and it’s tight. It was an easy fit for the 3rd Gen 4Runners, but a little tighter for the 5th Gen. But, we made it through just fine getting in. It was getting out that took a bit more effort. Thankfully our 5th Gen has the E-Locker. When exiting the trail, the way you come in is a little too tight from the other direction. There are tight sections of trees and the angles just aren’t right for coming out. So, you have to exit on the other side. It is on this side that you will have to be incredibly precise about your approach angle. It took me about 5 attempts to get the angle just right. After I did, I was then stuck between a tree and a hard place. Engaged the E-Locker, hit reverse and it popped me right into place. This was the most action we really saw the whole trail. As you roll through the first sections of the trail, it is a basic snow-covered trail with tracks already present unless heavy snow was coming down the night before. There are plenty of humps and washed out sections that make driving through here in the snow pretty fun. There were also a few tight sections where trees, branches, and brush will scrape your 4×4. If pinstripes are something you are not fond of, then don’t roll out here because you will get a few. But, it’s not really that bad. Not the worst I have seen by far. The Baltic Ridge Trail was a nightmare pinstripe scratching alley for multiple sections. Again, depending on what time you go will depend on how far you can push it. Our 3rd gen crew member @allterrain4r pushed it up the hill a few times and then so did @myoffroadradio only to be met with spinning tires. Fun, but nothing more up the hill at this point. At this section of the trail, you can romp around at the top of the trail, eat some lunch or just post up for a second. One of the homies, @1badt4r got stuck and we broke out the TREDS. 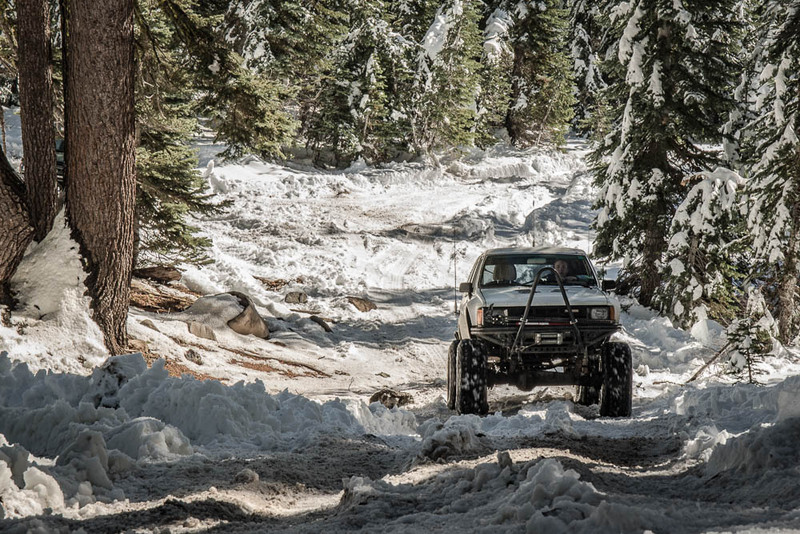 The TREDS Off-Road Recovery Tracks definitely helped with digging out some snow and getting us out of a snowy situation. Although these tracks did come in handy on the passenger side, we ended up digging all the way to the bottom until we hit the ground to get the driver side wheel out. So, did we really need the TREDS? Not really, but they did work on the other side for the 4Runner, so they were very nice to have on hand for this exact situation. 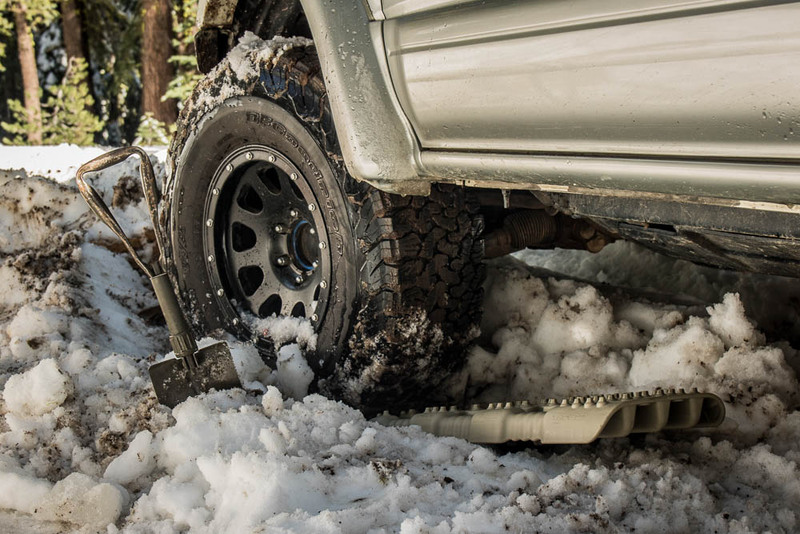 Whether you buy TREDS or MAXTRAX, you should always carry a set of Off-Road Recovery Tracks when you go out in the snow. As you are coming back down the trail, you have an open meadow to romp around/ wheel around on. 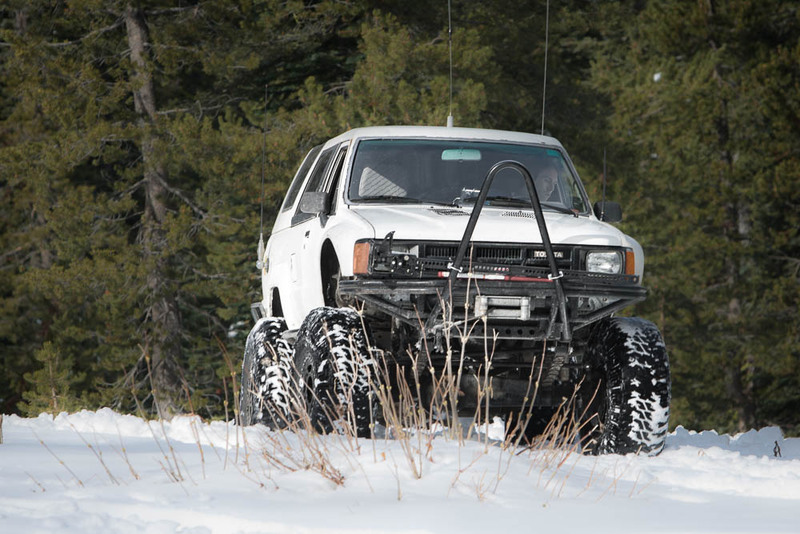 At this time, only the 1st Gen 4Runner (@myoffroadradio) was doing the romping. 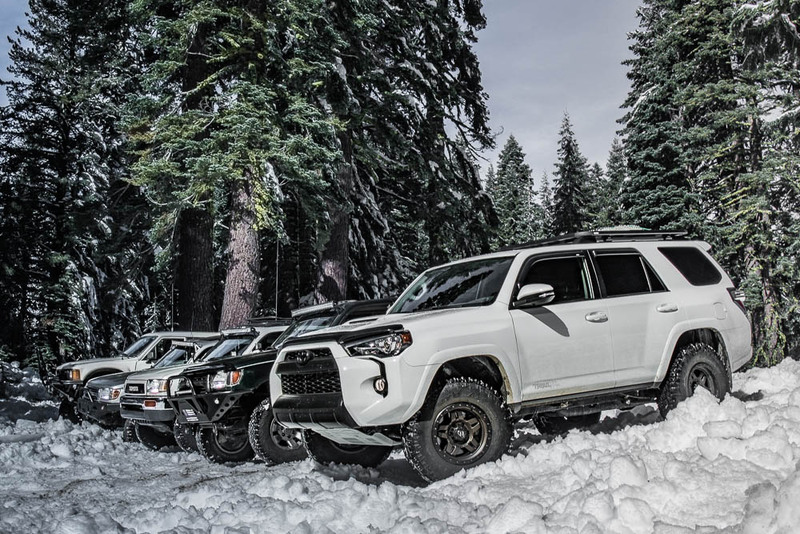 The 5th Gen and the 3rd Gens wouldn’t have had much luck playing in the powder. 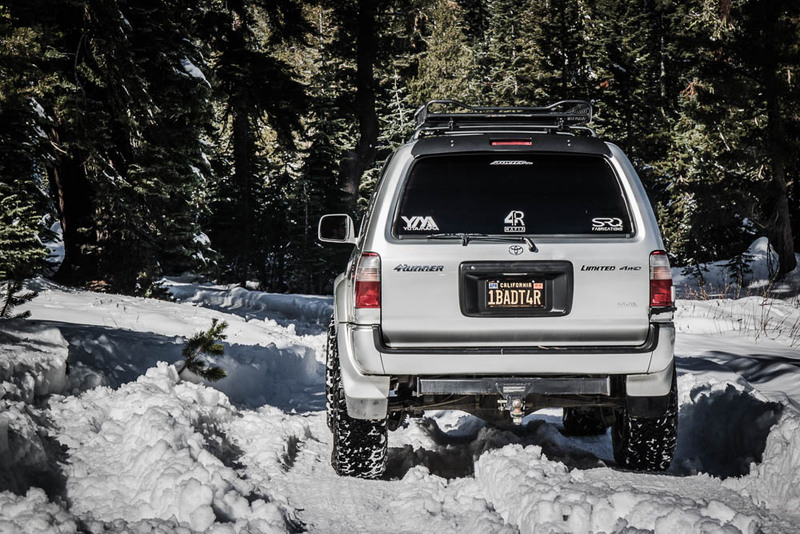 While the 1st Gen was playing in the powder and the other guys were doing what they do, I stopped to grab a few shots of the Trail 4Runner. Nothing too special in terms of shots on this trip but it was nice to get out of the house and kick it with some likeminded people in the woods. This is a cool little trail if you are in the Truckee area or live in Northen California. I wouldn’t “highly” recommend this spot if you are coming from the South Bay or anywhere further than San Jose. Heading back out the trail is just as fun as coming up. You run through multiple creek sections where water is running. You can splash through fat puddles and get pretty sideways in the snow. Snow just makes everything a bit more fun. Even though this is a simple little trail, we still had a good time. 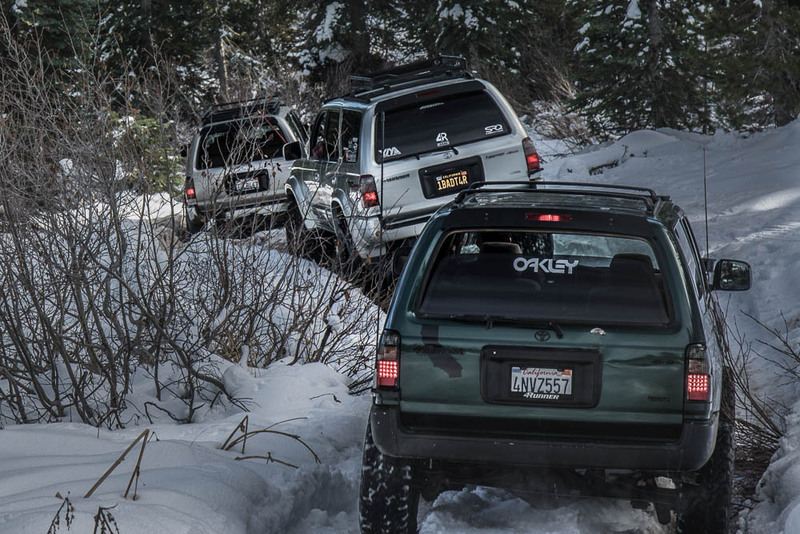 How can you not when its you and a bunch of 4Runners on some trail with a bunch of snow?? Cool spot and thanks to the 3rd Gens for the invite!